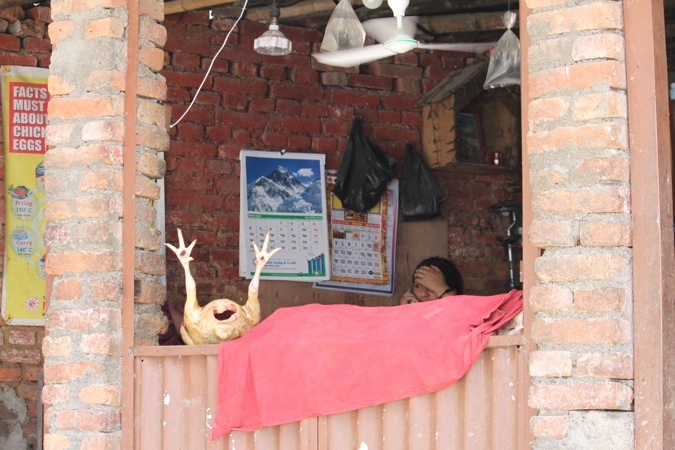 In Kathmandu horns blare, garbage burns, chickens are butchered, and the traffic stops only for cows, which are sacred in the Hindu religion. Life in the capital city is chaotic. But amidst all the frenetic energy the Kathmandu Valley is home to more temples, shrines, and stupas per square foot than anywhere else in the world. Followers of the country’s two major belief systems—80.6 percent of the residents are Hindu and 10.7 percent are Buddhist—live side by side in harmony. Nepal is the only official Hindu state in the world, but the Buddha was born here and most Americans associate the country with Buddhism because of the 6,000 Buddhist Sherpa people who live in the Khumbu Valley, the route to the high Himalayan peaks, including Mount Everest. “We have religious harmony between Hinduism and Buddhism,” Ganesh Sharma, Expedition Hanesbrands’ 29-year-old guide in Kathmandu tells me as our driver breaks and accelerates his way through the crazy traffic of Kathmandu. Sharma is a living example of Nepal’s melting pot of spirituality: The 29-year-old was raised Hindu—his father built a temple devoted to Lord Shiva, one of the most powerful Hindu deities. But today he wears Buddhist Mandala beads with a photo of the Buddhist guru Osha. He also shares the same name, Ganesh, with the beloved elephant-headed deity that appears in both Hindu and Buddhist traditions. 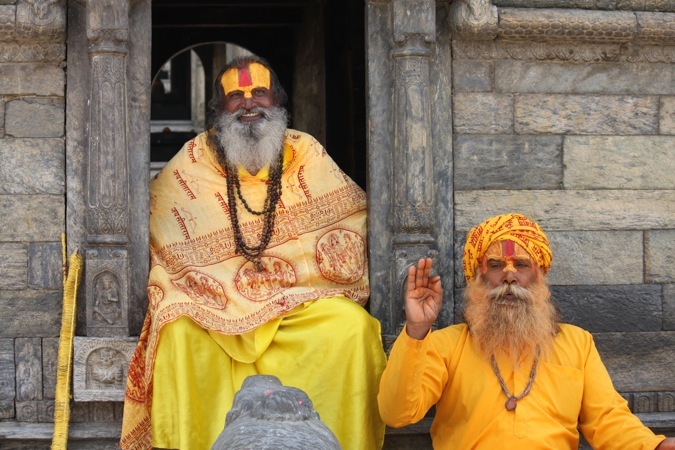 Before heading into the Buddhist high country, team Expedition Hanesbrands started our Nepali odyssey exploring three of the most important religious sites in Kathmandu. First stop, Pashupatinath, one of the holiest temples in the world for both Buddhists and Hindus. The gilded array of temples, some of which date back to the fifth century, are off limits to non-Hindus. But we watched the activity from across the sacred Bagmati River. 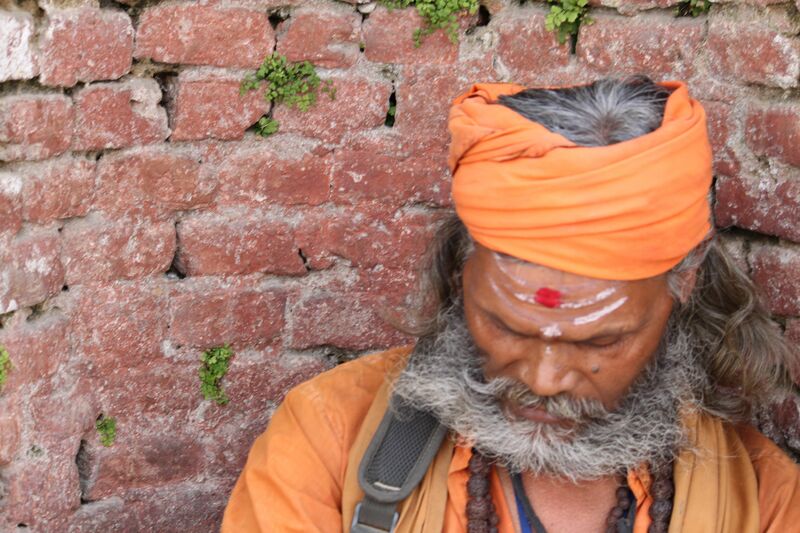 On the steamy hot Saturday, we walked past street vendors selling singing bowls and prayer beads while bare-chested Hindu holy men, their bodies decorated with brilliant red and yellow dyes, sat meditating on stone walls as their long, matted hair flowed to the ground. Across the Bagmati River, Hindu families burned the bodies of their deceased loved ones on funeral pyres as marigold wreaths and garbage floated in the water below. The smoky-sweet smell in the air was a mixture of burning incense and burning flesh. 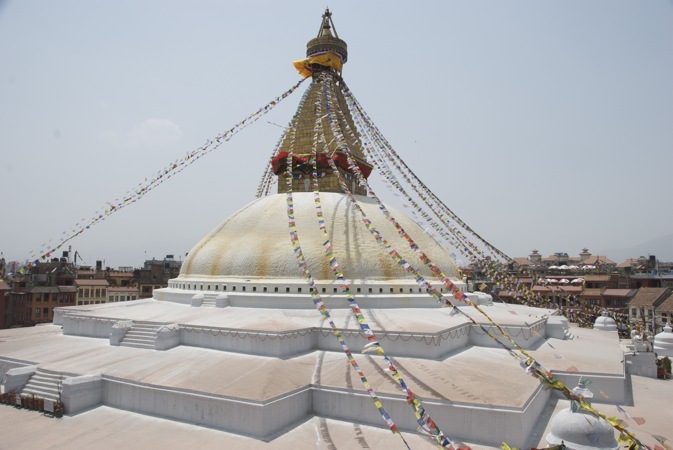 Next up was Boudanath Stupa, a round shrine 120 feet in diameter topped by a gold dome. The massive white structure, streaming with yellow, green, red, yellow, and white prayer flags flapping in the breeze, is “the jewel point in the center of the natural mandala,” a store of sacred energy that has been tapped into by traders and pilgrims for thousands of years. When we arrived, Hindu women were walking in a clockwise direction around the stupa, spinning prayer wheels (which they believe release prayers into the universe), while cymbals clashed and trumpets blared as a saffron-robed Buddhist monk chanted his own prayers in a Puja, a ceremony that leaves offerings to the deities. Our final stop on the tour required a trek to the city limits. Sitting on top of a hill, an island oasis to the surrounding chaos, is the famous Buddhist “Monkey Temple.” Normally, the four-legged primates reign supreme and are allowed to freely roam this complex miniature city of stupas and temples, officially know as Swayambhunath. But today the air was so hot that they all hightailed it for the trees, leaving a breezy view of Kathmandu to the hundreds of pilgrims who had walked the hundreds of steps from the city below. It’s easy to understand why hundreds of thousands of people have flocked here for centuries. “It is very peaceful here,” says Ganesh.